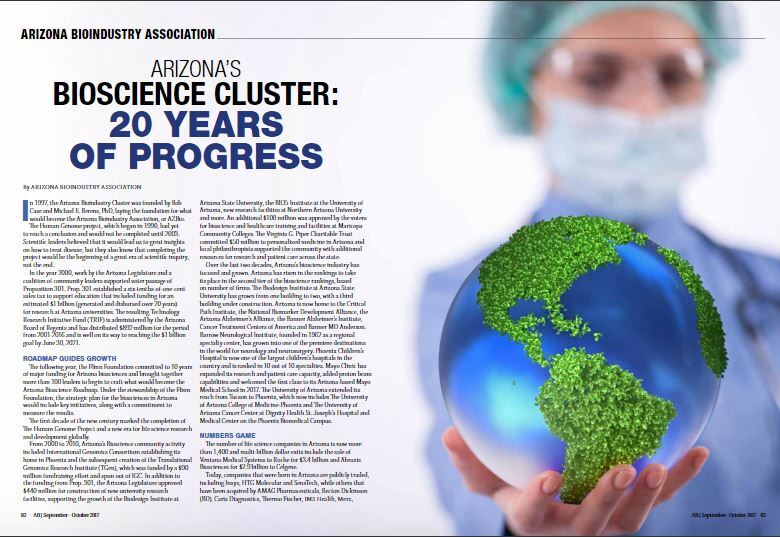 Arizona Bioscience Week (AZBW 2018) is our opportunity to share your story and connect our life science and healthcare community with leaders from across the state and guests from around the country. Taking place from September 30 to October 6, 2018, AZBW includes the AZBio Awards and 15th Anniversary Celebration, the White Hat Life Science Investor Conference and more. Now is the time to get engaged! Highlighting the important work you do and the impact you make. The AZBio Special Supplement in the Sept./Oct. issue of Az Business Magazine reaches 25,000 readers in print and 122,500 online. View ad specs. All pages are full page size. Distributed at the AZBio Awards and in meetings with key leaders year round. Page reservations must be received by August 3, 2018. Contact AZBio to reserve your page today.